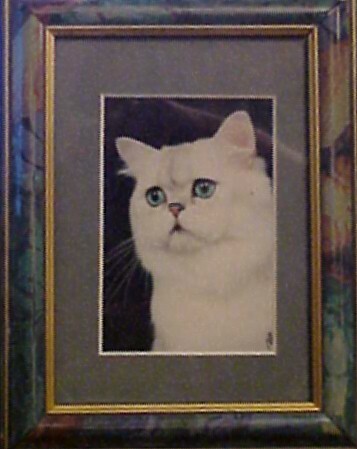 The de Mew Cattery is a small cattery located in the hills of beautiful central Arkansas dedicated to the improvement of the silver, chocolate and lilac persian. We breed only from the finest National winning lines under the CFA cattery name of de Mew. All of our kittens are guaranteed against Feline Leukemia/FIV and come with the following age appropriate vaccinations: Panleukopenia, Rhinotracheitis and Calicivirus. Below is de Mew's Sylver Token, a chinchilla silver bred here at de Mew. He is a lovely example of the silver breed. Token is a son of "Jazz". We are a PKD tested cattery but due to many factors unknown about PKD we do not at this time "guarantee" a kitten or cat purchased to either be negative or remain negative. All of our kitties that are sold as pets either come to you already spayed or neutered or come with a strictly enforced contract requiring them to be spayed or neutered by the age of six months. We strongly advise against declawing as we feel that it is a mutilation to the cat. Do you still want to declaw??? We will gladly hold a kitten or cat of your choice with a price appropriate deposit. However, deposits are non-refundable unless we decide that the kitten or cat is not able to be sold. In this case you would have the choice of a full refund of your deposit or placing your deposit on another kitten or cat of your choice. We ship within our own country. Your kitten can fly to your chosen destination out of Little Rock, Arkansas. 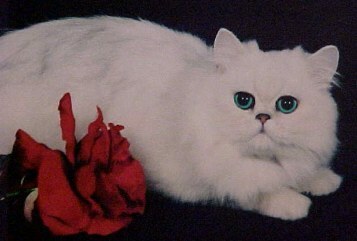 The silver portion of our breeding program is dedicated to our foundation male, CH Sylvershadow All That Jazz of de Mew. Jazz is the sire of many beautiful silvers and is behind most of the beautiful silvers from the Cats of de Mew today.